If you’re still in your right mind, then you probably haven’t seen Gotham’s season finale yet. If that’s the case, stop reading. NOW. Go and watch the episode, then come back to this recap. Gotham’s fourth season ended the same way all of its others did: with a bang, bodies hitting the floor, epic betrayal, crazy cliffhangers, and a whole lot of questions. And every time, the show finds away to escalate the drama. At then the first season, Barbara went crazy, Penguin took over the underworld after having a hand in the deaths of two of his rivals, and Bruce found the Bat Cave. At the end of the second, Strange’s monsters were released, Gordon left Gotham to find Lee, and Bruce realized there was a secret organization controlling his company. And the third? The third season finale seemed impossible to top—with Penguin getting his revenge on the Riddler, the city almost falling to the Tetch Virus, Ra’s al Ghul appearing for the first time, Selina getting her whip, and, most importantly, Bruce deciding to fight crime. Last season’s finale was a tough act to follow—but “No Man’s Land” set the stage for season 5 in an episode that was insane, brilliant, intense, and dramatic. But enough gushing. Let’s get to the recap. Like last week’s episode, this one is pretty interconnected, so I won’t be dividing it up into separate plots (mainly so that the timeline of events is clear). Suffice it to say that “No Man’s Land” revolves around Jeremiah’s and Ra’s plans to transform Bruce and the city of Gotham, Hugo Strange’s efforts to cure Butch, and Ed’s attempt to win over Lee once and for all. Warning: the episode itself contains graphic violence and profanity. The following recap contains massive SPOILERS. So the faint of heart might want to back out now. Plots A, B, and C: Some Men Just Want to Watch the World Burn. The episode opens with Selina being rushed through Gotham General Hospital on a gurney. A doctor explains to Bruce that they’ll do their best to help her, but the hospital is down to a skeleton crew thanks to the evacuation order. Selina asks if Bruce is going to leave her, and he promises to stay with her in the hospital. 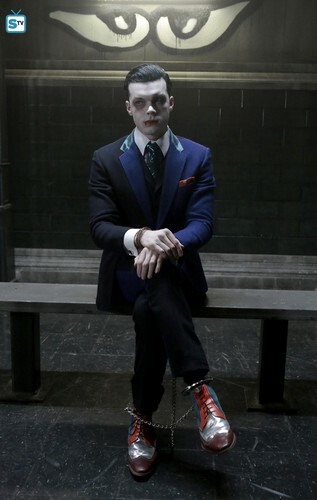 Meanwhile, the GCPD watches Jeremiah as he casually sits in one of their holding cells. Alfred tells Gordon he’s not sure why he brought Jeremiah instead of killing him, but Gordon says Alfred did the right thing. Alfred then leaves to meet Bruce at the hospital. Bullock tells Gordon that the bomb squad has been visiting the bomb sites, deactivating the bombs, and putting them in a warehouse. He adds that the mayor wants to lift the evacuation order, but Gordon says to tell the mayor that they can’t lift the order until all the bombs are found. Jeremiah addresses Gordon, saying that he wants to talk to Bruce. Gordon refuses and adds that Jeremiah failed to kill Gordon and destroy the city, just like his brother. Jeremiah replies that he’ll tell Gordon where the other bombs are if he brings Bruce. Gordon says that they’ve already found all the bombs, but Jeremiah claims that there other bombs hidden around the city as a redundancy. Gordon says that he’s bluffing, but Jeremiah asks how many lives he’s willing to bet on that theory. Jeremiah adds that he didn’t realize before what vision he was working towards, but now his eyes have been opened. He tells Gordon to bring Bruce once it’s clear that he’s not bluffing. Elsewhere, Hugo Strange (who was apparently so easy to find and convince that they did it offscreen) has Butch on a makeshift hospital bed. He remarks that Butch has no heartbeat and tells Tabitha that the chemicals from Indian Hill preserved his organs. Strange’s plan (which he promises will work) is to flush out the chemical with antitoxins, infuse Butch with fresh blood, and give him an electric jolt to the heart. Tabitha then gets a call about Selina being shot (from Bruce, I suppose) and decides that she’s going to kill Jeremiah. Butch tries to come with her, but Strange says that the procedure can’t be interrupted, and Penguin promises to stay and make sure everything goes right. He adds that he's doing this for Butch's sake, not Tabitha's. Next, Lucius Fox tells Gordon, who’s at the GCPD, over the phone that there’s no way of knowing how many bombs Jeremiah made. Harper lets Gordon know that the mayor’s on the phone and Gordon says to tell him that they still can’t lift the evacuation order. Gordon then notes that all of Jeremiah’s schemes have been a reflection of his brother’s, even his obsession with Bruce. He wonders aloud what Jeremiah could’ve meant about his eyes being opened to the vision he was meant to serve. Over in city hall, the Mayor has had enough of waiting and decides that it’s time to lift the evacuation order. Suddenly, one of his employees looks out the window and spots a man staring at them from a nearby building. The man is Ra’s al Ghul. Seconds later, one of Jeremiah’s bombs goes off, blowing city hall to smithereens. Back at the GCPD, Gordon slams Jeremiah against a wall and demands to know how many bombs are left and where they are. Jeremiah simply says that he wants to talk to Bruce. Gordon punches Jeremiah and tells him he will never see Bruce. Jeremiah says that more people will die if he doesn’t. Bullock then enters and tells Gordon that he’s needed. Gordon enters the lobby of the precinct, where he’s met by soldiers. Their leader introduces himself as Major Rodney Harlan from Fort Henry. Harlan explains that the government has declared martial law in Gotham and sent him in to take over command until the crisis is resolved. Gordon isn’t pleased by this development but tells Harlan about Jeremiah’s original plan and the secret bombs he has. He adds that it’s not clear who’s helping Jeremiah; rumor has it that his followers turned on him. Gordon explains that Jeremiah wants to talk to Bruce and notes that he’s most likely planning a trap. Bullock adds that Jerome tried the same thing when he took over the music festival. Harlan tells them to get Bruce. Gordon refuses. (Remember in season one when everyone kept pointing out that Gordon was an army veteran? How did he not get discharged? How?) Harlan has his men arrest Gordon, saying that he can’t let insubordination jeopardize the city’s fate. The men take Gordon away to a parking garage. Suddenly, the soldiers are shot down. The Riddler enters, holding a gun. He asks Gordon a riddle before shooting him with a tranquilizer. Gordon wakes up, tied to a table with a heavy weight suspended above him. He tries to tell the Riddler that Jeremiah has more bombs and that he needs to let him go. The Riddler says that he and Lee already tried to save the city and are still fugitives. Gordon replies that he gave Lee a way out by returning the money, but the Riddler points out that it was never an option, as she already dispersed the money throughout the Narrows. He then begins to lower the weight onto Gordon’s chest and remarks that he should be feeling 50 pounds of pressure. The Riddler explains that a similar device was used to get a confession from prisoners in the old days, but often ended up killing them. He ups the pressure to 100 pounds and says that Gordon is a dead weight, holding Lee to her past. Once he’s gone, she’ll become the person she was meant to be. The Riddler ups the pressure to 150 and says that he saw Gordon and Lee together. He notes that his plan is to make sure Gordon dies—and dies painfully. Over at the Sirens’ Club, Barbara tells the female League members that the evacuation has left a lot of the city undefended, making it the right time to take over territory. Suddenly, the lights flicker off, leaving someone to take down all of the League members in the darkness. The lights flicker back on and Ra’s appears. He says he just came to talk, but needed to take out the assassins as a precaution. He tells Barbara that he’s leaving Gotham and wants her to come with him. He admits that his initial vision of the city being destroyed in fire didn’t come true and theorizes that he doesn’t have the full power of the demon head. She gleefully guesses that some of the power is left in her and asks if he’s come to kill her for it. Ra’s says he’s not. He tells her that the woman in the tapestry from his vault was not a whore but a woman he loved. He claims that he offered the woman immortality, but she turned it down. He offers Barbara the same gift, adding that they can rule the league together. He tells her to think about it. When she asks about his vision of the city’s destruction, he says that he’s taking measures to ensure it comes to pass. He adds that the disaster will cause the rise of the person who brought him to Gotham in the first place: his heir. Back at the GCPD, the soldiers bring in Bruce and Alfred. Bullock tells Harlan that someone attacked his men and took Gordon, but he doesn’t seem to care. Harlan turns to Bruce and tries to tell him that they need his help, but Bruce isn’t too happy with the situation. He says that Harlan’s men took him and Alfred from the hospital against their will and adds that while he’ll do what they’ve asked, he wants to get it over with so he can get back to Selina. Bruce enters the interrogation room while Harlan, Bullock, and Alfred watch on a video feed. Bruce asks Jeremiah where the bombs are, and Jeremiah tells him to come closer. When he does, Jeremiah asks how Selina’s doing. When Bruce glares at him in silence, he says that the two of them are destined to be best friends because they’re alike. Jeremiah says that Bruce is still at war with his own nature and claims that he’s trying to help him embrace it. Bruce, however, isn’t having it. He says that nothing Jeremiah has done has been to help him, and adds that while both of them have darkness inside of them, Bruce knows how to control his demons. Bruce asks who he’s talking about, but Harlan tells him (through an earpiece to go back to asking about the bombs. He does so, but Jeremiah replies “What bombs?” He tells Bruce that the bomb planted in city hall was the only one and notes that it served its purpose: to bring Bruce to Jeremiah. Bruce asks again who Jeremiah meant by “he.” Jeremiah replies that “he” is the one who opened up his eyes and made him realize that he wasn’t working to create a new Gotham for himself, but for Bruce. He says it will be the “dark island” Bruce needs and that it will come to pass that night. Bruce asks again for a name, but Jeremiah redirects the situation to Selina, cruelly asking if she’s paralyzed. Bruce demands a name, and Jeremiah replies that Bruce already knows his name, as Bruce is his heir. As the truth dawns on Bruce, the lights flicker off in the entire precinct. When the officers rush to the interrogation room, they find that it empty, except for the dead corpses of a few guards. Meanwhile, the Riddler has increased the pressure on Gordon to 350 pounds. He says that they should be able to hear his ribs crack soon. Lee enters and states that 450 pounds is what it takes to crack a grown man’s ribs. The Riddler tries to tell her that it’s not what it looks like, but Lee knows that it is. He says that he’s only doing it to keep Gordon from holding her back. Lee says that the Riddler is insulting her if he thinks that she’d be weak enough to be held back by Gordon. She tells Gordon that the woman he loved is gone, and then tells both of him and the Riddler that her work in the Narrows is done; the neighborhoods are free from landlords and gangs, and each family has enough money. Lee says that she’s leaving and tells the Riddler that she wants him to come, but not unless he spares Gordon. After she exits, the Riddler interprets her ultimatum to mean that she loves him and decides to let Gordon go, saying that he can have Gotham. Over at the Sirens’ Club, Tabitha tells Barbara about Jeremiah’s escape. Alfred enters soon after her and asks where Ra’s is. Barbara says that she doesn’t know where he is, but knows where he’ll be before he leaves Gotham. She says that if they work together, Tabitha can kill Jeremiah, Alfred can save Bruce, and she can kill Ra’s. Barbara says that she has a surprise for him and holds up an ornate box. Not to be left out of the fun, Penguin enters. He explains that the only way to keep Butch on the table was to promise to help Tabitha. Barbara lets him join and tells the motley crew that it’s time to roll out. As Gordon stumbles out the Narrows, Lee tosses him the keys to her car and tells him to ice his ribs. He asks if it’s true that she’s leaving the city. She replies that it is. When he asks if she’s taking the Riddler with him, she says that it’s not his business. Gordon reminds her of how he said in the station that he wished he could change things between them. He says that he’d change everything that led them to this point. He’d run away with Lee as soon as they met. Lee says if Gordon had done all of that, he wouldn’t be himself. She says that she doesn’t want to change herself either, but admits that a part of her will always care for him and kisses him. She then tells him goodbye and to save Gotham. Gordon calls Bullock, who informs him that Jeremiah kidnapped Bruce and stole all of the bombs from the warehouse. Elsewhere, Jeremiah and League members bring Bruce to a building. Once he’s inside, they pull the bag off of his face and take him to Ra’s. Bruce asks how he and Jeremiah found each other, and Ra’s replies that they had a mutual interest in Bruce. Jeremiah asks Ra’s if his league members got the bombs. Ra’s confirms this and adds that the bombs are en route to their new positions. He says that they can watch the destruction from this building (as one side is basically a giant window). Bruce says that they’re both insane, but Ra’s says that they’re doing all of this to help him. He says that after the destruction, Bruce will rise as the dark knight that both Ra’s and the city need. Jeremiah admits that he could care less about prophecies; he just realized that his plans to remake Gotham and Bruce were interconnected. He says that the two of them will create a legacy in the city; when it falls, the they will rise. At the GCPD, Bullock explains that 12 transport vans were stolen, which must be how Jeremiah’s new allies are carrying the bombs. He tells Gordon the locations where the bombs have been spotted, causing Gordon to realize that the bombs are being moved to the outskirts of the city. Major Harlan arrives and asks Gordon what happened to the men escorting him. Harper follows soon after and informs them that there have been two more sightings along the highway. Gordon, recalling what Bullock told him about Jeremiah’s interrogation, realizes that he’s going to literally make the city into a dark island by targeting the bridges. He tells Harlan that they need to cancel the evacuation order and get everybody off of the bridges, but Harlan refuses. He tells his men to arrest Gordon, but Bullock pulls a gun on Harlan. When Harlan commands them to arrest Gordon as well, all of the GCPD cops pull their guns on Harlan. Gordon grabs Harlan’s radio and gives an order to clear the bridges. Meanwhile, Ra’s tells Bruce that the city will soon be every man for himself. Barbara arrives and says that it sounds like fun. She tells Ra’s that Gotham is her home and she doesn’t plan on leaving. She says that she doesn’t want to let him leave either and pulls out the case from earlier. Inside is the dagger that Bruce used to kill Ra’s (and the same one Ra’s broke in “To Our Deaths and Beyond”). Ra’s notes that she’s reforged it. Barbara replies that she suspects Ra’s will try to return to the city and doesn’t want to worry about looking over her shoulder. Ra’s reminds Barbara that she already tried using the knife and states that she’s outnumbered. She replies that his powers of foresight must not be working, and Penguin enters with the rest of her allies, leading the fight against Ra’s men. Elsewhere, Bullock and Gordon work on clearing the bridges. Harper calls Gordon to let him know that while the bridges have been officially closed, the stolen vans have been spotted on each bridge. Gordon, realizing that the bombs could go off at any time, quickly runs after a little girl who’s still on the bridge. At the same time, Ra’s manages to hold his own, fighting against both Barbara and Alfred. Tabitha fights Jeremiah. He manages to get the upper hand and holds a knife to her throat, but Penguin shoots him in the shoulder. Bruce gets loose and kicks the man guarding him. He then tries to attack Ra’s, but his hands are still tied and Ra’s easily deflects his attacks. Barbara, however, has a better idea: she thrusts the dagger into Bruce’s hands and then rams him forward to stab Ra’s in the chest. We get Ra's al Ghul back for four episodes only for him to die again because of that stupid dagger. As Ra’s begins to die, the bridges blow up. Jeremiah watches through the windows and smiles. Gordon, still on one of the bridges, grabs the little girl. He watches the others blow up and quickly runs off of the bridge and behind a car for cover. Side note: I was hoping that Gordon was extra worried about the girl because she was his niece or something—in certain continuities, Barbara Gordon, aka Batgirl, is his niece rather than daughter. And it’d add even more relevance to Jeremiah’s line about Gordon not being able to hold on to the people he cares about. Sadly, I think this character is just a regular girl. From the building, Penguin and the rest of Barbara’s team watch the destruction, dumbstruck. Ra’s, who’s fading away into fiery ash, tells Bruce with his last breaths that the choice is his: to stay Bruce Wayne, or become the dark knight this city needs. The Riddler, clutching a knife behind his back, says that he was an idiot to believe her. She never wanted to leave with him, she just wanted to save Gordon. Lee says that he and Gordon are more alike than he’d like to admit; they both think that they understand Lee, and both men want to change her. She replies that neither of them see the real her . . . and then stabs the Riddler in the gut. Lee tells him that her offer was real, but also that she knew that, once the Riddler realized that she’d never be the person he wanted her to be, he’d kill her. “It’s just what you do,” she says. He admits that she might be right—before mustering up the strength to turn and stab her in the gut as well. He then says that she’s wrong; he does see the real her. The two of them kiss, before collapsing on the ground in agony. Meanwhile, Tabitha and Penguin go to Strange, who has managed to turn Butch back to normal. Tabitha is overjoyed to see him looking like his old self and says she loves him. He says he loves her as well. Penguin, smiling from the side, seems oddly pleased at this interaction. Butch says that he’ll never forget how Penguin helped him and promises to return the favor. Penguin thanks Butch, says that he truly considers Butch a friend, and then apologizes. “For what?” Butch asks. Penguin responds by shooting him in the chest. Elsewhere, Selina is wheeled into an ambulance. Bruce runs after her and asks the doctor how she’s doing. The doctor replies that Selina’s surgery went well, but the bullet severed her spinal cord, so the damage is most likely permanent. The doctor also states that the hospital is shutting down and Selina is in their last ambulance. They have room for Bruce, but he needs to get in immediately so they can leave. Alfred wants to stay with him, but Bruce tells him to stay with Selina and make sure she’ll be okay. Alfred agrees, but says that once she’s safe, he’s going to come back and find Bruce. Back at the GCPD, Bullock tells Harlan that they can’t give up on the city. Harlan replies that there could be other bombs left, the power’s out, and the water supply is damaged. He states that the evacuation process is continuing overnight and by boat. Everyone is to leave the city, including the police, as the governor has declared the city off-limits until the situation is under control. Gordon refuses to leave and says that if Harlan is going to arrest him, he should do it now. Harlan, who’s too stressed and or tired to care, simply leaves without even trying to cuff Gordon. Once he’s gone, Bullock admits that Harlan’s right. Now the the government has given up on the city, the gangs will take over and turn it into a battle ground. Bullock is proven right in a montage that really has to be seen to be believed. Penguin gets a new base of operations. Freeze takes over a gang’s territory. Firefly and a team of arsonists mark their territory. Scarecrow decapitates a man for wandering into his lab. In the midst of the chaos, one of Penguin’s men brings Strange the corpses of the Riddler and Lee. Penguin’s request is simple: to “fix them.” Strange, however, smiles and wonders aloud what to do with the two of them. (While I know that human experimentation is Strange’s M.O., I hope he doesn’t try to give either of them powers or something. That’d just be too much). Over at the Sirens’ Club, a male member of the League (joined by his brethren) tells Barbara that, because she defeated Ra’s, they have decided to follow her leadership. As they kneel before her, Penguin’s men bring in Tabitha, still wounded from her encounter with Penguin. She tells Barbara what happened. Barbara, deciding that men are what’s wrong with Gotham, decides that the city needs a man-free zone and orders the female league members to kill their male counterparts. They oblige, and hang two corpses next to a banner that marks Sirens’ Territory as women-only. At the precinct, Lucius turns on the lights. He explains to Gordon that he took one of Jeremiah’s battery bombs before it went to the warehouse and was able to restore it to its purpose as a generator. Bullock tells Gordon that he told Lucius they were staying, and Lucius adds that there are others on the way. Gordon says that there’s something he needs Lucius to do. In an alleyway somewhere, Bruce beats up two men (who I assume are criminals) and demands to know where Jeremiah is. They don’t know, and he replies that if they see Jeremiah, they should tell him that Bruce is coming for him. After the men run away, Bruce notices something in the sky: a searchlight. The searchlight is mounted on top of the precinct roof, where Gordon stands in a trench coat. Bruce (having followed the light) approaches him, and Gordon says that Bruce isn’t supposed to be here. Bruce points out that Gordon and the 12 cops downstairs aren’t supposed to be in the city either, and surmises that they stayed to fight for Gotham. Gordon says they’ll have to go block by block and admits that, while he’s not sure what they’ll find, he expects the worst. The show then cuts to two disturbing scenes. The first is of a man in an old church with horrific bat wings descending on people. The second is of a masked woman approaching a masked boy who’s killing someone with a hatchet. Back on the roof, Bruce notes that the searchlight seems like it’s daring the criminals to come after the remaining cops. Gordon says, “Let them come,” and explains that the light is there to let the good people know that there are still people willing to fight. Bruce, agreeing, recalls what Gordon told him after his parents were murdered: “However dark and scary the world might be right now, there will be light.” The episode ends with the two of them staring at the searchlight, looking for all the world like a young Batman and Commissioner Gordon. For the Episode: As I said earlier, “No Man’s Land” is a killer way to end a season. It’s an episode with a lot of moving parts, but most of those parts work. I’ll start with the few that don’t. Like the story of Lee and the Riddler. I was glad that Lee got some closure with Gordon, but otherwise, I wasn’t that invested in their relationship towards the end of the season and it was hard for me to sympathize with either character. As the season’s progressed, both characters have become more manipulative, selfish, and (in some circumstances) downright unlikeable. I think the scene of the double murder had some poetic value in it, but no enough to justify the relationship OR two more resurrections of major characters. Which brings in Hugo Strange, who’s also a bit of a weak link. At this point, Strange is a walking deus ex machina—he’s just someone you track down if you want a virus cured, a person de-Grundy-fied, or two lovers resurrected. And if you thought that someone who crossed the Court of Owls would hard to find, you’d be wrong. In season 2, Strange was a menacing and cunning villain, but ever since season 3, he’s just been someone for other characters to use when they need a problem solved. He doesn’t have his own goals or motivations anymore, apart from the love of human experimentation. Still, I’m willing to allow a Strange-Ex-Machina because it led to Penguin’s betrayal. I wasn’t too interested in Penguin recruiting Butch in earlier episodes, but now that storyline has retroactive value—because Penguin wasn’t trying to get Butch to be his henchman again (at least, not for good). He was working towards the larger goal of paying back Tabitha for his mother’s murder. The question is: has Penguin’s revenge on Tabitha been a long time coming, or did it come out of nowhere, since Gertrude’s been dead since the first half of season 2? I lean towards the latter, but maybe that’s a good thing. We don’t expect it and neither does she. In season 4, Penguin’s arc isn’t tied to Tabitha. It’s mainly tied to his rivalry with Gordon and Sofia Falcone and his need for control of the city, and the continuing theme of his weakness being love (as seen in his friendship with Martin and his early trust of Sofia). It would make more sense if the episode had focused on him exploiting the chaos to find Sofia in a hospital and kill her once and for all. Still, Penguin’s revenge wasn’t a bad twist. I just felt like it could’ve been built up more, you know? As for Butch, as much as I’ve loved Drew Powell’s performance, I feel like it is time to lay the character to rest. The crazier and more comic-book-esque the show gets, the less characters like Butch fit in. He’s become almost anachronistic, as he’s a holdover from the old-fashioned days where the mob ruled in Gotham. He never evolved, like Penguin or Fish Mooney. And I don’t think the show’s version of Solomon Grundy was worth keeping around for another season; there are only so many stories you can tell about a zombie with super strength Given how many storylines Gotham likes to tell at once, it makes sense to shed the ones that aren’t as compelling. Speaking of compelling, let’s get to Bruce’s storyline (which I guess is more or less also Gordon’s, as they’re both racing to stop Jeremiah, but let’s be honest: it’s more about Bruce than about Gordon). As you can probably guess, I loved it. One of the best parts of this episode was Bruce’s tranquil fury in the interrogation scene and how Jeremiah played off of it, pushing all of his buttons. There’s got to be a kind of chemistry between Batman and the Joker—not a romantic chemistry, of course, but a rivalry. A rivalry that has evolved over the course of almost eighty years. A rivalry where the Joker wants to bring out the worst in Batman, and Batman strives to stop the Joker without killing him so that he can prove there’s a difference between the two of them. A rivalry where the Joker can’t just kill Batman because that’d take all of the fun out of his escapades. A rivalry where the Joker is the chaos that challenges Batman’s need for order. That relationship relies on a chemistry that’s hard to achieve. Some of the best portrayals of this relationship are seen in The Dark Knight, Batman: The Animated Series, Batman Beyond: Return of the Joker and Batman: Under the Red Hood. Gotham raised the stakes by entrusting this relationship to two young actors: David Mazouz as Bruce Wayne, and Cameron Monaghan as the Joker (call him what you want, Warner Bros., but that’s who he’s been playing all along). In my opinion, they couldn’t have chosen anyone better for the task. Mazouz’s portrayal of Bruce as serious, determined, stubborn, and temperamental played well off of Monagahan’s portrayal of Jerome—an over-the-top, unpredictable, psychotic showman. But the relationship between Bruce and Jeremiah is even better because they’re so oddly alike. They’re focused, intelligent, pragmatic, single-minded and determined. And both characters slip easily into other roles—Bruce playing the role of a drunken billionaire brat when he felt like it, and Jeremiah portraying both his brother and an innocent version of himself. But I digress. My point is, Bruce and Jeremiah are a big part of what make this episode work. What also makes this episode work is that it sets up an amazing premise for the final season. It sets up a Gotham City that needs Batman more than ever, one where Bruce can’t afford to take a break from vigilantism, as he did in this season. This is a Gotham where the villains (one of the show’s greatest strengths) have the run of the city—and, for once, the season doesn’t end with Penguin back in control. He’s scrambling for power as much as any of his rivals, which sets up a new status quo. For once, no one is the “king” or “queen” of Gotham. It’s anyone’s game. I’d also be remiss if I didn’t point out some of the parallels between Bruce and Gordon in this episode. Gordon voices his regrets about not leaving the city with Lee, but she says that if he’d done that, he wouldn’t be himself. That’s who this version Gordon is: someone who wants to save Gotham. Someone who, almost invariably, puts that mission before anything or anyone else in his life. And that’s who Bruce chooses to be by the end of the episode. He breaks his promise to stay with Selina because he feels the calling to save the city. Bruce has now chosen, for better or worse, to take responsibility for the city in its darkest hour. And that’s what he’s always going to choose. No matter how much he cares about people, they come second to that mission. And maybe that’s what this season was about, really—not Bruce acting as Batman by going out as a vigilante, but him learning what it means to to be Batman on a mental level. What it means to take responsibility for the entire city—for the lives you take, like Ra’s, and the lives you spare, like Jerome and Jeremiah. In the same vein, Gordon learned what it meant to be a leader this season. He couldn’t get anyone to follow him until he demonstrated (in “A Day in the Narrows”) how much he was willing to risk for his fellow officers. He also learned that being a leader might mean carrying the weight of your own mistakes and moving past them in order to be an example to others. This was the season where Gordon really began to feel like his future self—older, wiser, and more capable of leading the GCPD. And that’s why the ending scene of this episode works. Because even though Gordon wasn’t using the searchlight to call to Bruce, he came anyway. That’s who Bruce is—Gordon’s ally in the fight for Gotham, whether Gordon realizes it or not. You see with Bruce and Gordon standing on a rooftop, but that’s not what you feel. You feel that this is the first of many meetings between the caped crusader and the future commissioner. You feel that, at long last, Gotham has its dark knight. Season 4 was difficult because I felt like so many of expectations were subverted—namely, I expected to see Bruce working as a vigilante the entire season, but that didn’t happen. And I used to feel disappointed about that. I used to feel cheated. But not anymore. As I said earlier, this episode made me realize that season 4 wasn’t about Bruce acting as the dark knight; it was about him becoming the dark knight. He had to learn to make peace with the darkness within himself before putting the mask back on—if he hadn’t gone through that turmoil, he could’ve lost control (especially after Jeremiah shot Selina). Putting Bruce in a suit and mask wasn’t enough to make him Batman. I see that now. In order to complete the transformation, he had to learn, like Gordon, how to live with his own mistakes and focus on helping others. So this is it, folks. The end of season 4. I expect you won’t hear from me for a while, as season 5 doesn’t begin until 2019, according to Comicbook.com. Still, schedule permitting, I should be back to writing recaps as soon as Gotham returns. Until then, I’ll probably reread Batman: The Long Halloween to cope with the withdrawal. It’s been fun for me to comment on the show this season, and I hope you’ve enjoyed my unique mix of commentary, theory, and rambling. Feel free to comment below with your thoughts on the finale, theories, questions, and hopes for season 5 (I personally, would like at least one scene that takes place in the future).